TOFU MOM . . . and gravy! 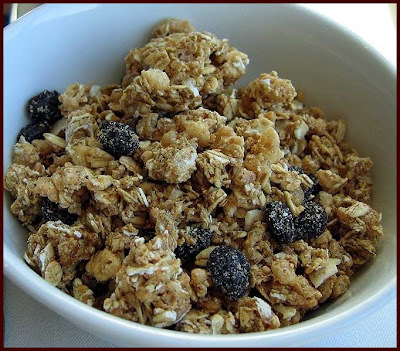 : Holiday Gift Idea: Coconut-Ginger Granola!! Holiday Gift Idea: Coconut-Ginger Granola!! It's the middle of December and I'm still craving the amazing granola that my friend (and breakfast cook) Mariela whips up at Casa del Toro, a bed-n-breakfast in Santa Fe. I must have eaten the entire batch when I was there this past summer, I LOVE homemade granola SO MUCH! Here ya go. Leave out or change whatever you don't have, the beauty of home-made granola is the FLEXIBILITY!! Change whatever you don't like or don't want to use. I'm not a fan of walnuts or molasses (though Mariela swears she uses them in HER granola, I somehow cannot taste them - who knows) but you won't find them in here - if you like them, feel free to add. Because I had so many odds and ends, this batch turned out pretty decadent with "extras" - not as awesome as Santa Fe, but still good. Best of all? This makes an AWESOME Holiday Gift! Just stick it in a pretty jar!!!! 1 cup shredded coconut - I had some unsweetened, but it's harder to find; regular, sweetened would also work. Put coconut oil, sugar, maple syrup, vanilla, and salt into a large pot over low heat, and stir until sugar has dissolved. Take pan off the stove, and stir in the nutmeg, hemp seeds and ground oats - mix well. Add the 5 cups of oats and mix well. It'll take a while, you can drizzle in some orange or apple juice, a few drops at a time if it's REALLY dry (oats can vary in how dry they are...). Bake in a pre-heated oven at 325 for about 30 - 45 minutes, stirring about every 10-15 minutes, until evenly toasted and golden. Break up clumps if they are too big or not browning evenly. Keep your eye on the granola as it browns fast. Allow to cool to room temperature, then store in an air-tight container. Serve with soy milk, soy yogurt or crumbled over applesauce or chopped fresh fruit. Yum. I love the idea of giving away granola - I think I need to try that! MMMmmm, I lOOOOOVE homemade granola, this looks awesome. I love the idea of adding ginger. Homemade granola is one of the most wonderful inventions ever. I love knowing what my husband and I are putting into our bodies because I made it myself. Thank you so much for this! I've actually already decided on making granola for gifts this year, even though I've tried making it. I've been looking around the web for different recipes, and I just printed yours out.